There were two obvious candidates. The trusty Salust had been Julian’s faithful second in command and was widely respected. A long serving soldier, he had exactly the qualities the army needed at that moment. When surrounded by enemies you need a safe pair of hands. But the one man who had doubts was Salust himself. He thought himself too old for such a burden. I think that shows pretty clearly how suitable he actually was, but there was nothing that could be done to change his mind. The man who Julian really ought to have named as his successor, and who he probably imagined would actually succeed him, was his cousin Procopius. He was the last surviving member of the house of Constantine. He was nearby in charge of 30,000 fresh troops and so ought to have had not only a reasonable claim on the throne but also no particular difficulty in enforcing that claim. But instead in a twist that is hard to explain, a man called Jovian found himself being acclaimed, first by a few soldiers then steadily by more and more until the whole camp was clamouring for his elevation. He was a young and popular captain of the emperor’s guards. His family had produced some good soldiers in the past, though Jovian had not yet had the opportunity to show whether he was cut from the same cloth as them. He may well have been mistaken for another more senior general with a similar name by some of the troops who appeared to be supporting him. Whatever, he was a most unlikely emperor and his sudden promotion cannot have been something that either he or anyone else was expecting. The news of Julian’s death spread rapidly. The Persians soon got wind of it and Shapor ordered an immediate attack on the rearguard. The Roman’s were hard pressed but their courage and discipline held. Unable to dislodge them by force, Shapor switched from military to diplomatic means to get the Romans out of his empire, and offered talks. This was when he finally found the weak spot. Not surprisingly for someone with no experience or even any opportunity to mentally prepare himself for the role, Jovian was not really a match for the Persian when it came to the arts of negotiation. The discussions were prolonged by every trick that could be contrived. Every day that passed depleted the Romans’ provisions and weakened their bargaining position. Jovian’s personal position was also being strained. His legitimacy was distinctly questionable and he had to get back to Constantinople as quickly as he could to establish himself before a rival took advantage of his absence. So Shapor was in a position to drive a hard bargain, and boy did he ever do so. The agreement they reached was one that was highly favourable to the Persians, a huge turn around in the fortunes of an empire whose capital city had been under siege only a few weeks before. Once terms had been agreed the Roman army was still not out of trouble. They had to get across 200 miles of barren desert to reach safe territory and fresh provisions. The deal struck did not provide for the Persians to resupply the army, nor were they allowed to use the Persian held bridge across the Tigris. The Romans were getting steadily hungrier and weaker, and a great many of them drowned trying to swim across the river. But eventually they arrived at the fortress city of Nisibus and safety. Jovian’s priority remained to get back to the capital to start securing his hold on his unexpectedly attained power. He may have been weak on military matters and international diplomacy, but he understood court politics well enough. And he was quite right to feel anxious about his new subjects’ reception. The news of Julian’s death was met with disbelief and despair. Libanius in Antioch could hardly bear it. He looked at his sword and considered suicide. He stopped himself only when he realised that it was his duty to write the eulogy for his hero. In Carrhae the unfortunate messenger bringing the unwelcome news was buried under a pile of stones. Everywhere pagans were horrified by the fear that the alters to their gods, so recently restored, would soon once again be desecrated. And when the terms of the peace treaty became known, grief turned to despair and anger. Jovian had given up all claim to influence in Armenia. He had handed over 5 provinces to the Persian empire. His calculation was no doubt that he was giving up some provinces to ensure peace while he installed his grip on the rest. But while this was rational for him, it was a humiliation for the Romans. Since the foundation of the empire, indeed since the time of the republic, Terminus the god of the borders had never been forced from any part of the boundaries by a victorious enemy. No leader in Roman history had conceded such dishonourable terms. In fact they prided themselves on putting the public interest before the private. The story of Regulus, a Roman general in the war against Carthage would have been well known at the time. Regulus was captured and sent back to Rome with Carthage’s terms for peace. He announced the conditions to the Senate, urged their rejection and then in accordance with his promise to his captors returned to Carthage to be executed. Jovian was not a Regulus, as he was soon to prove. In a further humiliation, Jovian had agreed to hand over five frontier fortresses including Nisibus itself. This was a major alteration to the balance of power between the two empires. It would now be the Persians that had a well defended frontier. The large cities of the region like Antioch would now be at risk from Persian attack at any time. Politics was a very direct personal business in the ancient world. Jovian himself was in Nisibus and had to answer the pleas by its citizens for the treaty to be repudiated. They had resisted the Persians in three great sieges, and the idea of being handed over without a fight was horrifying. When Jovian would not agree to break his agreement with Shapor, they requested permission to take up arms themselves. 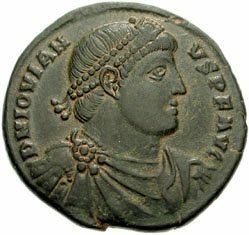 But Jovian’s priority was peace and he insisted on honouring the terms of the treaty. He got out of Nisibus as quickly as he could. Most of the population left as well, carrying as much as they could but leaving behind homes that many of them had lived in all their lives, refugees not from a scene of battle but from a deal between monarchs. It was a grim and shameful start to Jovian’s reign. Jovian did know what he was doing though. Shapor could only take over some provinces. His more deadly enemies were internal ones. He rapidly moved to get people he could trust into positions of authority. He was himself a Christian and he announced his intention that Christianity would be restored to its old privileged position. This was a move that gave him the support of a powerful faction. The still influential pagans were likely to resist the new regime and so they were shunted out of the way. Some were just killed, with no excuse even being given. The most dangerous figure was Procopius who was relieved of his command under the pretext of being given charge of the arrangements for the funeral of Julian. This was quite a neat political move. The genius of Julian and his personal popularity demanded that his death be marked by a significant ceremony. Even his enemies in general agreed, although one leading churchman proposed that his body should be fed to the dogs. Christianity has never been particularly strong on morals, but even so every age seems to produce someone who cannot even meet those modest standards. But there was never any question of desecrating Julian’s body and he was buried with some ceremony as he had requested, in Tarsus. In a previous age the Senate would have had to vote his inclusion into the number of the gods. Times had changed and whatever its feelings the Senate could not flagrantly ignore the official religion. But in Julian’s case official recognition was hardly necessary. No previous emperor deserved this honour more and for the few remaining years that the pagans would be allowed to practise their faith, Julian was worshipped in the temples he had restored. Gibbon is above all a superb writer, and the chapters on Julian in particular are amongst his best. I have to give Gibbon himself the last word. The remains of Julian were interred at Tarsus in Cilicia; but his stately tomb, which arose in that city, on the banks of the cold and limpid Cydnus, was displeasing to the faithful friends, who loved and revered the memory of that extraordinary man. The philosopher expressed a very reasonable wish, that the disciple of Plato might have reposed amidst the groves of the academy; while the soldier exclaimed, in bolder accents, that the ashes of Julian should have been mingled with those of Caesar, in the field of Mars, and among the ancient monuments of Roman virtue. The history of princes does not very frequently renew the examples of a similar competition.